the Salamanca repository just got itself a new (shorter) URL : http://salamanca.codeplex.com/, thanks to the CodePlex guys. The old one (that I won't write here) remains valid. as some of you probably already noticed, Salamanca got itself a logo. Not so surprisingly, it is a train (the name Salamanca is a reference to The Salamanca, the first commercially successful locomotive built in 1812). The original design for this picture can be found on the Open Clip Art Library. The streamline design of this engine fits well with the concepts of industrialization that are behind our vision of our Software Factory. And it is also a reference to the excellent Streamlined Object Modeling book. Though our vision of business object implementation differs somewhat from what can be found in this book, their description and analysis of 12 "collaboration patterns" for modeling real-world relationships is an invaluable resource for any person who is involved in modeling activities. As Salamanca users will inevitably be. Early in the new year to come, you will have the opportunity to exercise your modeling skills on the first version of Salamanca, that will include a SDML graphical designer and code generation. But for now, I've got a train to catch. To Salamanca via Oslo ? Now that our libraries are functional enough, it is high time we started getting into the modeling part of our software factory. The first step is to define proper syntaxes for our DSLs : the Salamanca Domain Model Language (SDML) and the Salamanca Activity Model Language (SAML). XSLT code is tedious to write and hard to debug. a DSL modification need the manual refactoring of many, hard to maintain files. The DSL Tools is basically the first step in the road to realizing the full SF vision outlined in The Book. Hence, if you try to build a real-world factory just using DSLs, you will find it fairly incomplete and not supporting typical scenarios such as providing an initial solution structure where you will put your DSLs, etc. The missing features, though, are most probably those that will come (or become unnecessary) as the full vision is implemented. In the meantime, it feels lacking. Anyway, the first impressions are excellent, and it feels like time invested in designing our DSLs around these tools will be far from being wasted time. It's actually taking the kind of models that you're seeing arising in specific domains, like software management in System Center, or your data design over in SQL, or your process activities over in BizTalk and saying, we need to take all these domains and be able to put them into one model space. In fact, we need to let people create their own domains that aren't just isolated, but that exist in this one modeling space. 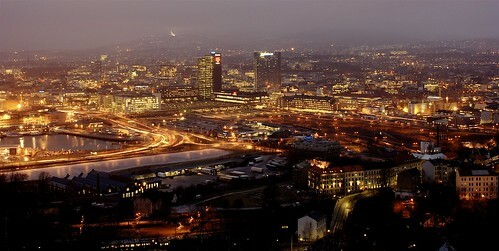 And that's what Oslo is about. I could not agree more. Salamanca needs to have domain models and activity models in the same modeling space, simply because a business activity is by essence bound to manipulate business objects : a SAML model is linked to a SDML model. So it looks a lot like Oslo could be the best way to go to Salamanca. That is sure going to be a long journey, but very likely to be an interesting one. For now, I am sticking to my DSL Tools. Whereas Data Access could be considered as yet another solution to a very common problem (the ORM problem), Data Activities is quite original in its conception and implementation. The concepts involved here are much less refined or complex, but have already proved to be very powerful. this activity is about getting a list of products that match a specified name. the first state is a question that asks for the name. the second (and last) state is a treatment that finds the corresponding states. let's add to this a rule that specifies that the name we are looking for should not be empty (nor null). For this activity, we'll reuse the Product class we have defined in the Domain Model quick start. The proper way to implement this would be to add a FindByName method to this class and query the database, but we'll do it the Activity way this time. the list of products matching that name. You see there is a bit more than just having a Name and a Products property. When inheriting from ActivityData, you have to implement two abstract methods that create and restore backups on the data. We won't really need this system in this activity, but data must implement IBackupable and this is quite straightforward as you can see in the code above. Note in the question state how we enforced our business rule (the name must not be empty). Our activity is ready. Or is it ? What we have here is still an abstraction, and we need an implementation for our QuestionFactory. And that is precisely the magic of it all : we just need a concrete QuestionFactory. You can see here how an ActivityController is used to execute an activity. As all answers are automatically provided, our activity is executed from the beginning to the end in one phase. In a Windows Forms application, the execution would stop at the question state to let the user fill a text box in. When a Find button would be clicked, the controller would be told to resume the activity execution. You can find a complete working example, as a Visual Studio 2008 solution, here. The same activity is implemented as a unit test, and as a Windows Forms application (the underlying database is Northwind on SQL Server, for which a data file is included in the downloadable sample). Now that the first release is out, let's start playing with it. The first step is to design our business objects ; we'll eventually have a DSL for this (the SDML), but basic UML will do for now. We'll begin with a (very) simple model. Sorry, I could not think of anything more simple ;-) Our application will deal with products, whose sole property is their name. one to get a specific product instance from the data backend. one to get all the products form the data backend. The DomainModelKeyedCollection returned can be used a regular Collection, as well as a Dictionary where products are indexed with their primary keys. As you can see, this is quite straightforward : just inherit from Salamanca.DataAccess.DomainModel, override CreateId and add your properties. The static methods have just been defined here for convenience. Also, note the attributes above the Name property, that define our first business rules. That's it : derive from DataMapper and fill the gaps with pure ADO .NET code. You can already understand that this is where code generation will greatly improve the developer productivity. It creates a new collection based on a prexisting Connection, and our data is simply not cached in memory. You can find a complete working example, as a Visual Studio 2008 solution, here. As you can see, we can build a simple application that integrates our Domain Model in a very few lines of code, with business rules validation (the underlying database is Northwind on SQL Server, for which a data file is included in the downloadable sample). Next time, we will create our first activity. Stay tuned ! Data Activities defines the base classes that help us implement our architectural pattern, centered around business activities. All the concepts developed in this context owe a lot to the vision and the ideas of Yves Darmaillac. treatment states : those require no external data (think user interaction). For instance, a treatment state can perform an action on our domain model (create a new reservation), or directly on the data (calculate booking fees). All a treatment state needs to perform its action is data. question states : those do require external data. For instance, a question state can ask for data for a domain model instance (fill reservation details), or it can ask for a specific domain model instance (pick up your seat). Usually, a question is answered via user interaction (but not necessarily, like in the case of unit tests where answers can be automated). The golden rule here is to make sure that all the application behavior is defined in terms of activities. Treatments are by definition self-sufficient and generic. Questions define abstractions that have to be implemented by the HMI layer. In effect, such abstractions can be implemented by all kinds of presentation technologies (console applications, Windows Forms, ASP .NET, WPF...) with no impact on the business logic. IActivityState is an interface implemented by an activity state, and treatment states in particular. IQuestionActivityState is a specialization that is implemented by a question state. IActivityData is implemented by an activity data holder type : it holds the data that is manipulated by a specific activity. IActivityParameters is implemented by an activity parameters holder type. An activity parameter could be seen as an immutable activity data. IActivityController is implemented by an activity controller. Such a class is essential to the activity execution : it initiates the activity, terminates it and controls all the state transitions in between. All the states must be validated before transition : this is achieved via the integration of Data Rules. The library defines base implementations for all these interfaces, and helpful classes to implement questions in specific presentation technologies (so far Windows Forms and ASP .NET). Activities are at the core of our architecture : they manipulate data and act as a separation of concerns between the business logic and the presentation. In the future, we will be able to design our activities via our own DSL (SAML), and have base implementations (and best practices) for questions in other technologies such as WPF or ASP .NET AJAX. a mRNA template. It holds the code for a specific protein. This code has a start and an end, and has to be followed in order. This is our finite state machine, each codon being seen as a state. a ribosome. This is the protein "factory". It "reads" the codons one by one and performs an action on each of them : add the corresponding amino acid to the chain that will become our protein. This is our activity controller. the protein. This is the result of the entire process. This could be seen as our data. This one is simple : Data Access is an Object-Relational Mapping (ORM) library. As such, it owes a lot to the experience of NourY Solutions in the field of data management. But our ability to structure this experience and put it into words has been greatly enhanced by the remarkable work of Martin Fowler. Many concepts in use in this library are described in his book Patterns of Enterprise Application Architecture. easy serialization of business object instances (XML for use in Web Services, JSON for Ajax applications...). persistence backend abstraction : business objects should easily be persisted against any database backend, like a standard RDBMS solution (Sql Server, Oracle, SQLite...), or a web service, or even a flat file. the developer always has to be in control : for instance, no on-the-fly SQL generation (though this could be added later as an option). easy code generation (we want to build a Software Factory, after all !). IDomainModel : is implemented by a Domain Model. There is also an abstract class (DomainModel) that can be used as a base implementation for your business objects. It provides Data Rules implementation, serialization, and UI integration (through the implementation of the standard IDataErrorInfo, IEditableObject and INotifyPropertyChanged interfaces). IDataMapper : is implemented by a Data Mapper, which basically provides the persistence backend abstraction. The library provides base implementation for persistence based on standard ADO .NET, Enterprise Library Data Access Application Block or Web Services. IDataTransferObject : this interface is implemented by a Data Transfer Object. It is used to hold the data of a Domain Model, to transfer it between a Domain Model and a Data Mapper and to serialize our Domain Models. IPrimaryKey : is implemented by custom Identity Fields types. A DSL to design our Domain Models would look a lot like a class diagram. And it does actually ;-) (more on that later). Ability to serialize trees of objects. Next time will be the time to introduce Data Activities. Now is the time to delve a bit more into the libraries that lie at the core of our factory. On top of them lie Data Rules. First of all, note that this library owes a lot to the work of Paul Stovell, and that most of the concepts discussed here can be found in this article of his. So Data Rules is a validation framework. The goal here is to handle invalid data in your custom types a bit like DataSet does : instead of throwing an exception every time invalid data is affected to it, it records whether the data it is containing is valid or not; and if not, why. This allows for much smoother UI integration (that is what ErrorProvider and IDataErrorInfo are all about). IValidatable is here to help the developer define a custom type that has such a behavior. A validatable type is one for which any instance can be validated against a specified set of rules. In Data Access, our business objects are validatable : you can always know whether data is valid or not, and why. And if you try to persist an invalid business object, you will get an exception. IRule is an interface implemented by a validation rule. A rule can be specific to a property of your custom type (is it null ? ), or not (for rules that involve many properties for instance). The description of a rule contains a message that can be displayed to the end user (like "This field is required"). The library predefines a set of useful rules (like NotNullRule, StringLengthRule, RegexRule...). These rules can also be specified as attributes. And there is an adapter that allows to integrate the Enterprise Library Validation Application Block in Data Rules. As previously stated, Data Rules is used by Data Access to add validation capability to our business objects. It is also used by Data Activities to enforce business rules in our data flow. In the future, we can imagine to create our DSL to design our rules, and why not store some of them in a configuration file. Next time, I will try to summarize the vast subject of Data Access.